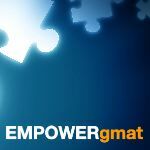 How many minimum prep test one should give before appearing for the GMAT? There's no 'minimum' number of practice CATs that you should plan to take during your studies, but you should certainly plan to take at least a few (at regular intervals) so that you can track your progress and learn more about your 'weaknesses' - so that you can focus on the proper areas as your studies progress. There really is no magic number. Some take only 2-3 tests, while others could take as many as 15! You don't need to take too many until and unless you are suffering from some major strategy issues. I advise test-takers to take 1 test a week (or 1 in 10 days) after completing 70-80% of the curriculum. Usually, they are ready for the official test after 4-5 practice tests. The takeaways from practice tests should be the strategies that work for you, the sections in which you are strong/weak, what you need to do to improve time management skills etc.